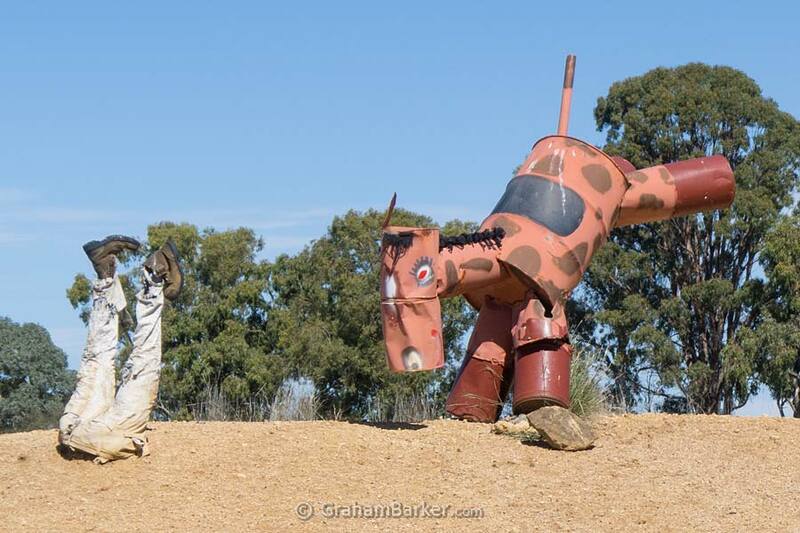 The small town of Kulin is 280 east of Perth, a short detour south of the most direct route to Hyden and Wave Rock. It is best known for its horse races and associated events - the Kulin Bush Races held on the first weekend in October each year. 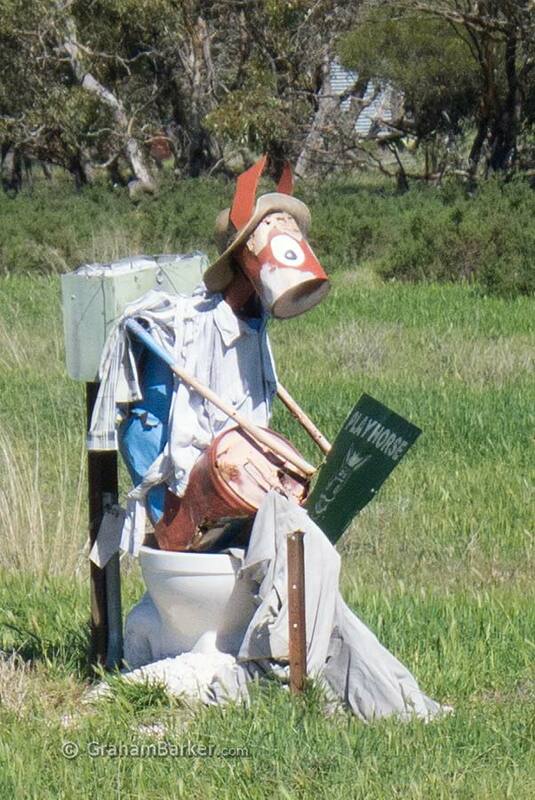 In the mid 1990s, residents thought the races could be promoted by something quirky, like the artistic scarecrows around Balingup but on a horsey theme. 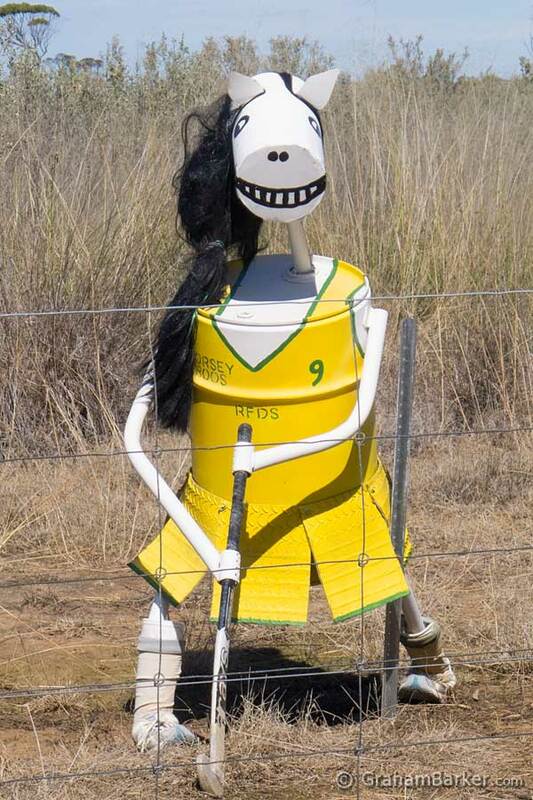 Soon the main road out to the race track, 15km east of town, was lined with horses made out of farm junk. 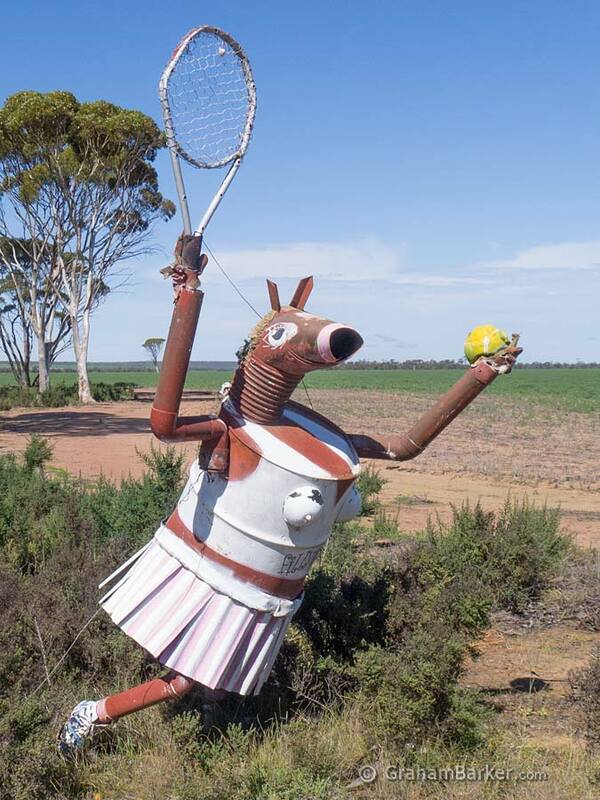 Corrugated iron, 44 gallon drums, tin cans, old pipes and other bits and pieces lying round were assembled into horse characters. 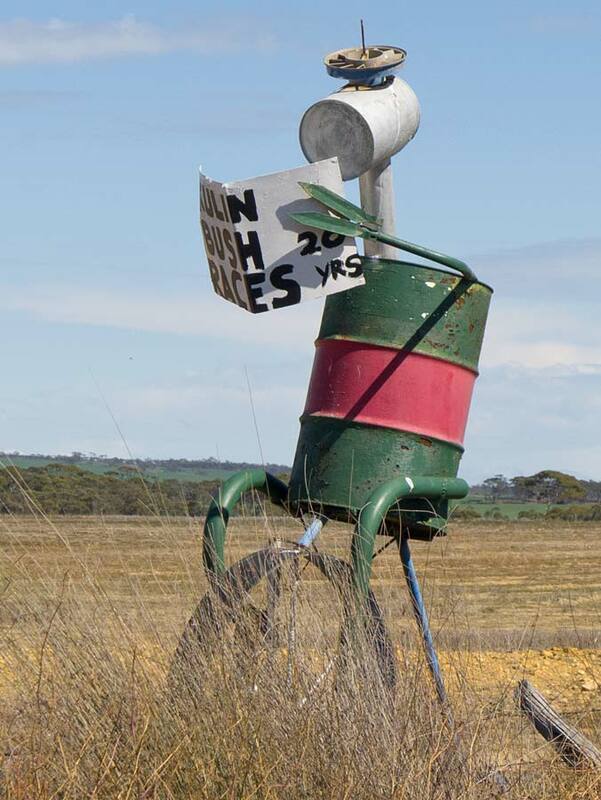 With some paint - and much imagination - they became amusing additions to the roadside. Some have signage with witty puns that induce a laugh, or perhaps a groan. Farmers still put up some new ones each year in friendly competition with each other. The strategy worked - Kulin is probably now known as much for its tin horses as for the races they originally promoted. It was the tin horses that drew me. I'm not a great appreciator of art (sometimes I just don't "get it"), but I do enjoy something odd and out of the ordinary. Especially involving humour and ingenuity. 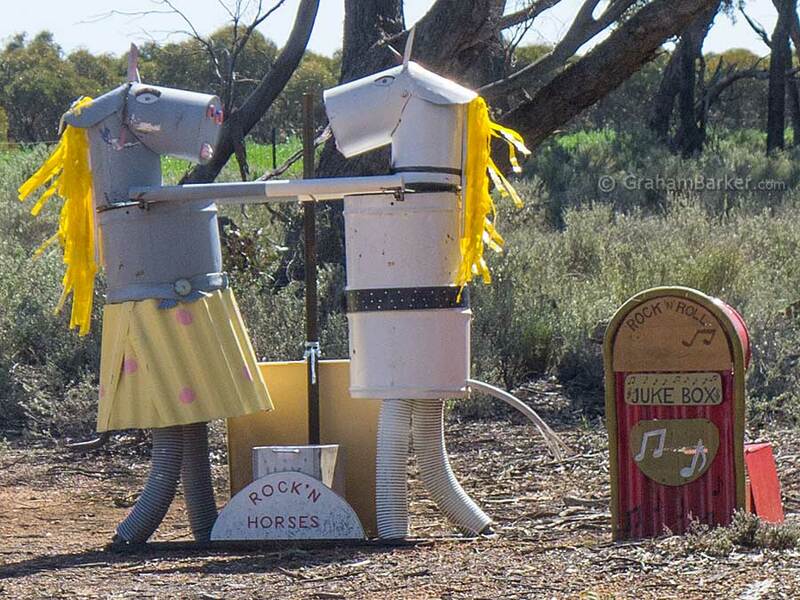 At first I wondered if the Tin Horse Highway might be a bit cheesy, or something less than I hoped it might be. Years of visiting heavily advertised and over-hyped attractions can foster that fear of disappointment! But I needn't have worried - it was better than I imagined. The tin horses are easier to illustrate than describe, so I stopped many, many times to take photos. For me this was the key to enjoying them. If you just drive straight through and only glimpse them, you’ll be missing much. It is only by frequently stopping, and taking time to take in the details, that the creativity and humour can be fully appreciated. That's what I did … although I should point out that by stopping at nearly all of them, the 15km drive can take a long time. 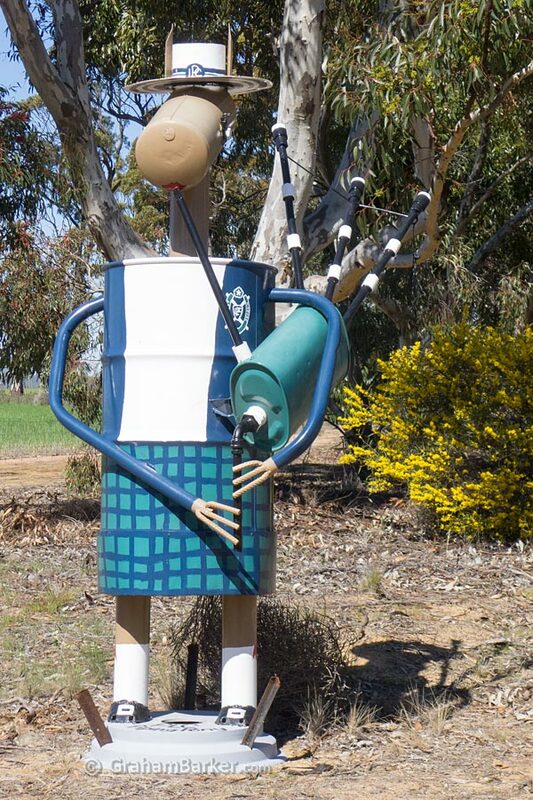 If going to the Kulin races you can’t miss them, as they line the road between the town and the race track. Approaching Kulin from Corrigin will reveal the West Kulin horses too. If driving between Perth and Wave Rock they can be seen on the way, if a small detour is taken. Anyone else driving through the central wheat belt may need to detour a little more, but those who value quirky things should find it worthwhile. Even those who, like me, are not arty.